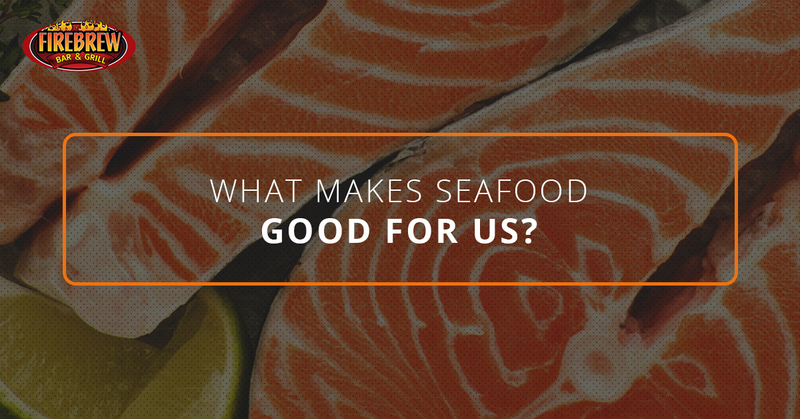 What Makes Seafood Good for Us? Seafood is something that most people either love or hate, but at our Virginia Beach bar and grill, we simply cannot get enough! If biting into a flaky fish meal sounds right up your alley, then we invite you to join us for either lunch or dinner. Regardless of what time of day you see us, we guarantee a fresh and delicious meal that will keep you feeling satisfied for hours. While you have probably heard over and over again that seafood is good for you, what exactly is it about fish that keeps our bodies so healthy? We at FIREBREW have the answers to share with you today. Fish is a high-protein food that also happens to be low in fat. However, that isn’t the only appeal of this meal. White-fleshed fish, specifically, tend to have less fat than any other source of animal protein. Oily fish have a tendency to remain high in omega-3 fatty acids, which are considered to be healthy fats. Our bodies do not have the ability to produce many of these nutrients, so fish are an important part of a healthy diet. An added bonus? Seafood is extremely low in the “bad” fats that are found in red meats, also known as omega-6 fatty acids. Why are omega-3 acids good for you? These acids can actually maintain your cardiovascular health by assisting with the regulation of blood clotting, as well as vessel constriction. They can assist with prenatal and postnatal neurological development. They can help decrease tissue inflammation and even ease the symptoms caused by rheumatoid arthritis. They can help those who have irregular heartbeats (or cardiac arrhythmia), reducing symptoms of depression and even slow mental decline in the elderly. Which fish have the most benefits? Studies have shown that the omega-3s found in fish are the ones that are most likely to provide health benefits. The fish that are highest in omega-3s, low in contaminants, and are eco-friendly include wild salmon from Alaska, Arctic char, Atlantic mackerel, sardines, sablefish, anchovies, farmed rainbow trout, and albacore tuna. Should you just take fish oil supplements? While you can take these supplements, we have found that eating fish is a much tastier option! However, many stores offer supplements of omega-3s and fish oils. These oils are made from fish that has been caught for human food, as well as those small fish that were caught for animal feed. Keep in mind that contaminants, such as PCBs, gather in fish oil just as they do in fish. Never buy capsules that have been made from non-purified fish oil. Where else can I find omega-3 acids? You can find omega-3s in flaxseed, walnuts, and wheat germ. While these are still good for you, we can guarantee that they do not provide as many benefits as a meal made from fish will. Who needs to avoid seafood because of the risks? Both women of childbearing age and small children can see an impact in a child’s development when the fish contain an excessive amount of mercury. Older women and men may be able to actually eat more seafood because of the levels of omega-3s. People who are at a higher risk of cardiovascular disease need to be cautious with their fish intake if the fish are contaminated, as any fish high in PCBs can lead to health issues. It is best to consult a doctor if you have questions. There are many low-contaminant, high-omega-3 options available, so it is usually easy to avoid fish contaminants. At FIREBREW Bar & Grill, we proudly offer some of the most delicious seafood in the Virginia Beach area. Take your pick from our Panko Encrusted Red Snapper, our Honey Sriracha Salmon, Sesame & Wasabi, Pan Seared Mahi Mahi, BBQ Bacon Wrapped Shrimp, FIREBREW Crab Cakes, Turf Tacos, or our Surf Tacos. Regardless of what you decide to order with us, you are sure to enjoy both the delicious taste and the health benefits of eating a meal rich in both flavor and omega-3 acids. Regardless of what your dinner preferences are, we would love to have you and the family stop by and see us at FIREBREW tonight. With our local beers on tap and our self-service wine station, you are sure to feel taken care of until the very last bite has been eaten. Delight your taste buds with something fresh and different. We will see you tonight for dinner!